Not wanting to be seen as just another cabin rental company, we at Large Cabin Rentals have decided to give guests a break down of everything that truly does make us unique. Yes, that is true. Our very own Big Moose Lodge cabin in Pigeon Forge is considered to be the largest cabin rental in America. With 16 bedrooms and over 11,000 square feet, there is no doubt that your group of up to 74 guests will rest comfortably inside The Big Moose Lodge cabin rental in Pigeon Forge. Click here to check availability and rental costs for The Big Moose Lodge cabin rental in Pigeon Forge. If the largest cabin rental in America is just a little too big for you and your group traveling to the Smoky Mountains, then maybe you and your group will enjoy spending a few days inside our Mountain Top Retreat cabin rental in Pigeon Forge. A spacious 8 bedroom cabin, Mountain Top Retreat is unique because not only does it offer guests three levels to spread out and relax in, but it also has an 18-hole putt putt course in the lowest level of the cabin. In addition to all the luxurious amenities found inside the Mountain Top Retreat cabin in Pigeon Forge, this rental is also just minutes away from all the fun things to do in the Smoky Mountains, including Dollywood. Also, guests to this cabin will also enjoy exclusive access to the seasonal outdoor pool and pavillion area at the Wildbriar resort. 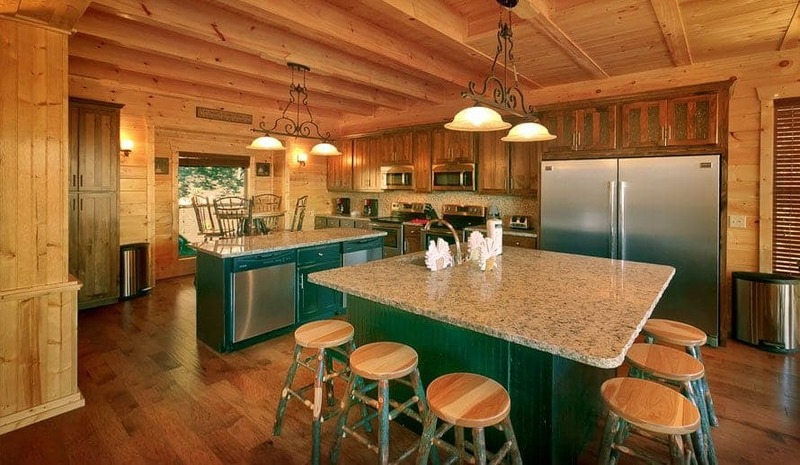 Click here to learn more about Mountain Top Retreat cabin rental in Pigeon Forge. Although most of the cabin rental companies boast that they have the best views, it is really us that has some of the most unbeatable views of the scenic Smoky Mountains. Whether you are staying in one of our large Pigeon Forge cabin rentals that is located inside the Wildbriar resort or you choose to stay on top of the mountain at The Preserve Resort, we can guarantee that you and your group will not find a better view of the Smokies than from inside one of our rentals. At Large Cabin Rentals, we know how much fun taking a large group vacation to the Smoky Mountains can be. Not only do you get to spend some quality time with friends and family that you may not be able to see often, but it is also a good way to create new relationships while catching up on some much-needed rest and relaxation. Because of this, we have carefully selected each cabin in our inventory to include only cabin rentals in Pigeon Forge and Gatlinburg that can accommodate large groups vacationing to the Smoky Mountains. Read here about how our large Pigeon Forge cabins can help with your next large group vacation to the Smoky Mountains. If you are traveling with a large group, then it is important to know whether you will be able to park near your cabin or not. At Large Cabin Rentals, we are happy to announce that all of our large Pigeon Forge cabin rentals are motor coach/tour bus accessible. This means that you and your group can easily drive right up to your Smoky Mountain vacation rental, and you won’t have a long distance to carry your luggage back and forth. If you aren’t traveling to the Smokies in a motor coach it’s ok. You and your group will love all of the space these for parking outside of our rentals. If you would like to learn more about Large Cabin Rentals, or you would like more information on one of our many spacious cabin rentals in Pigeon Forge and Gatlinburg, be sure to give us a call today at 1-877-544-9594. One of our friendly vacation specialists will be more than happy to help any and all questions that you and your family may have.